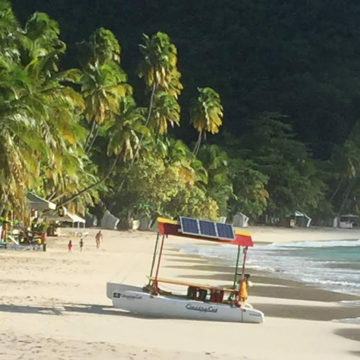 As the Caribbean’s integral tourism industry has been hurt by the global financial downturn, countries in the region have been forced to looked to new markets and devise new initiatives to spur both new visitors and new investors. Jamaican Minister of Tourism Edmund Bartlett talked to Caribbean Journal about the newly-important Latin American tourist market, the impact of the REDjet deal and Jamaica’s entrees into niche markets like sports tourism. How would you describe the current state of Jamaica’s tourism industry? The industry is in good shape. The growth continues, albeit at a slower rate in the last three months than the first half of the year, primarily because of contraction in air travel patterns. In fact, the global indications are that there is in fact a slowing of air traffic activity, with airlines making a switch to higher load factors as opposed to greater frequencies. So Jamiaca has had that impact in terms of airlines using larger units, larger carriers, larger equipment, if you will, while having stronger, heavier loads. You begin to get 90 to 95 percent load factor, you increase the demand. And for that, demand has resulted in slower growth rates. What are the biggest challenges facing the country’s tourism? The biggest challenge for us is airlift, and the continued availability of destinations such as ours. The second key is investment — investment in new rooms, and also new attractions. These are the key elements, in my opinion, that are in growth. As we speak, we need 2,000 new rooms to meet the new demand that we have. How much of an impact will the REDjet deal have on Jamaica? Not much. The thing is that the REDjet deal is intra-regional activity, and intra-regional travel is not a very significant part of tourism movement, even in the Caribbean — certainly not as far as Jamaica is concerned. The deal of this as far as the wider situation is that it affects our continued pursuit of open skies agreements with a number of countries, which would allow for greater competitiveness in the aviation landscape here. So that, I believe, will create its own energy for expansion, hopefully in airlift in the wider context. You announced a deal earlier this year to bring Latin American tourists to Jamaica. How important is the Latin American market to Jamaica, and what are you doing to attract it? Well, that initiative is important, given the slowdown in outbound traffic from the originally strong markets of the United States, in particular, and also the airlift reconfiguration that we’re experiencing. South America is, when you look at the global trend, representing an area of growth — of stronger growth than in North America. And Brazil, Colombia, Chile, Argentina are among the four outbound destinations for us. So that market is going to prove very vital for our own growth and expansion programmes, that are expanded by attracting the presence of Spanish investors with products that are known in South America. So the implications of that growth are very key. In addition, we have the kind of attractions and increased number of attractions that have a close affinity to Latin culture. What are some of those attractions? Well, we just launched a new one, Captain Hook, which is a maritime experience, that plays on the Pirates of the Caribbean, and looks at the impact of the Spanish on the development of the anglophone Caribbean. What are some of the other initiatives the Ministry is working on? Well, the key initiative that we’re driving now is, one, to review and carefully assess the airlift capabilities, and their potential, along with developing partnership relations with airlines and operators to enable a more secure airlift for us. The second initiative is to look at the new markets — the emerging markets, Brazil, China, Russia and India and some of the satellite countries around these emerging markets, while strengthening our traditional markets like Canada, which is the strongest growth market for us at the moment, along with the UK and the US. The third initiate is strengthening our product, by way of expanding the range of attractions we have and increasing the room stock. Bahamian Tourism Minister Vincent Vanderpool-Wallace told us earlier this year that sports tourism is a strong part of that country’s strategy. Given Jamaica’s success in areas like Track & Field, are you looking into that? Indeed. I didn’t give the details of the development of the expansion of product, but niches such as sports tourism, edutourism and volun-tourism are some of the areas, along with health and wellness, that we’re focusing on. But sports tourism is going to be essential — not only because Jamaica is one of the most outstanding sports destinations in the world, but also because Jamaica has the potential to make sports and entertainment — being the home of reggae, for example — a combination that will go a long way.